We ate lunch at The Devonshire Fell last week, a hotel and restaurant set high above the River Wharfe in the village of Burnsall in the heart of the Yorkshire Dales. The restaurant has stunning views across the rolling hills of the Dales, the river flowing slowly below. It’s an exceptional setting for a restaurant, and the food matches the view. Nuggets of soft braised pig’s cheek served on silky mashed potato with rich and tasty boudin noir as a starter that I’d quite happily have taken as a main, such was the tastiness of the pork. 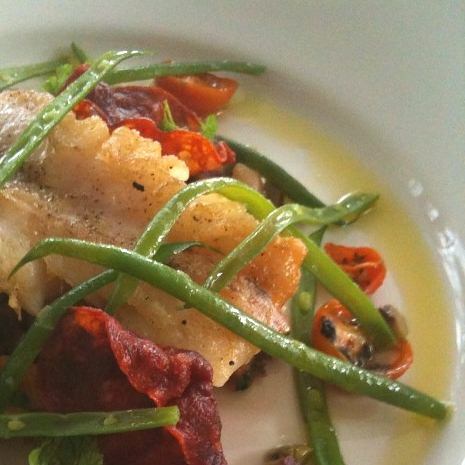 For a main course, hake paired with chorizo and haricot beans, soft tender and collapsing, the chorizo punctuating the warmth of the beans with sharp and spicy bursts of flavour, against the satisfying mildness of a piece of perfectly cooked hake. 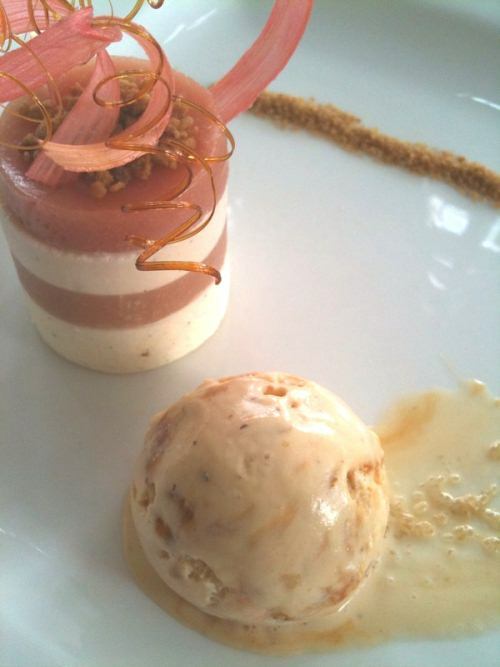 For dessert, a ridiculously good rhubarb jelly with pannacotta, stacked skyscraper high with a delicious, nutty ice-cream. The head chef, Dan Birk, at twenty-six, is one of the rising stars of the Yorkshire restaurant industry. He’s a talented chef, trained in some of the best kitchens in the country and now cooking his own menus. He told us that he’s got the right team in his kitchen and that he’s excited about his new menu, which draws on the vast range of top quality ingredients available in the Dales. It’s probably not surprising that locality is key to Birk’s cooking. His meat, for example, comes from the butcher just down the hill. There’s a wealth of world-class produce right on the doorstep, so why not use as much of it as possible? The Devonshire Fell’s local pride goes beyond just its suppliers. The Fell has spent a lot of time getting to know their neighbours. The occupants of a close by farmhouse are sent off to the Michelin starred Devonshire Arms just down the valley for dinner and a bed for the night whenever the Fell has a potentially noisy wedding booked. Every Monday night is ‘locals’ night – sausages from the local butcher, cooked a couple of different ways at a reasonable price. The villagers come for sausage and mash, the odd pint of Copper Dragon and a bit of a chat. It’s a clever business model, turning a traditionally dead Monday evening into something commercially and socially worthwhile. The Fell looks after the villagers, and the village looks after it. The Devonshire Fell’s food is elegant but not fussy. Elaborate food wouldn’t work in a place like this, which needs a slightly more relaxed style, a bit of homeliness about it. Birk delivers this, but there’s still the sense of a classically trained hand in his food. It’s a very good balance between exciting and accessible. I was extremely impressed with The Devonshire Fell. It’s a superb restaurant, with an excellent chef at the stove, who’s producing some inspiring and high quality food. Very much recommended – Dan Birk is one to watch. Great post, and beautiful pictures! I'd like to be eating there right now! Not sure about that Yorkshire Post review at all.He was annoyed that they didn't mention the particular type of garnish used. What's all that about, then? Lovely post (my mouth is watering) and beautifully crafted photos. We're just hemming and hawing about going back to North Yorkshire for our hols this June and your post will definitely sway the vote in favour of a return visit. I'm just preparing French smoked herring fillets in oil with raw carrot & onion and potatoes from the garden steamed in the Thermomix as tonight's starter. They'll be followed by Hugh Fearnley-Whittingstall's rolled and stuffed pork belly from Bob's Hogs, a mere half mile down our road. Now that's what I call local! I landed on your blog via your post about HFW's slow-cooked pork belly and I'm delighted that I did. I look forward to reading more of your prose.